My intralipids arrived today. They were frozen. Guess I’ll have to call and make sure that’s not an issue! Did your Lupron shots bruise you? I’ve done follistim (subcutaneous) in the past and had never had an issue with bruising. I had some redness and itching for about an hour and bruised on my first injection! I have a feeling I’m going to look rough by the end of this! Can’t say I ever bruised on Lupron. 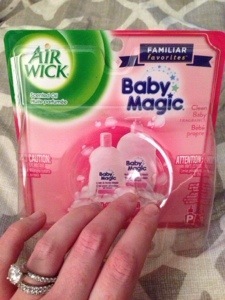 I think the air freshener is wonderfully named, may it bring you some baby magic too! Dear Daughter-in-law it sounds like you have been on a really long arduous treadmill while juggling work, boxes, cars, moves, physicians wisdom, and now the cold. You need a nice message at least once a week to sooth you. We send you prayers and warm thoughts. Will just let me know about your blog. Nice to have some contact. Love, ya! It had been a lot of work but we are getting unpacked! Lots of changes all at once! We are excited about what the future could hold and I’ll keep you updated! We need to plan a visit soon! Love you guys!